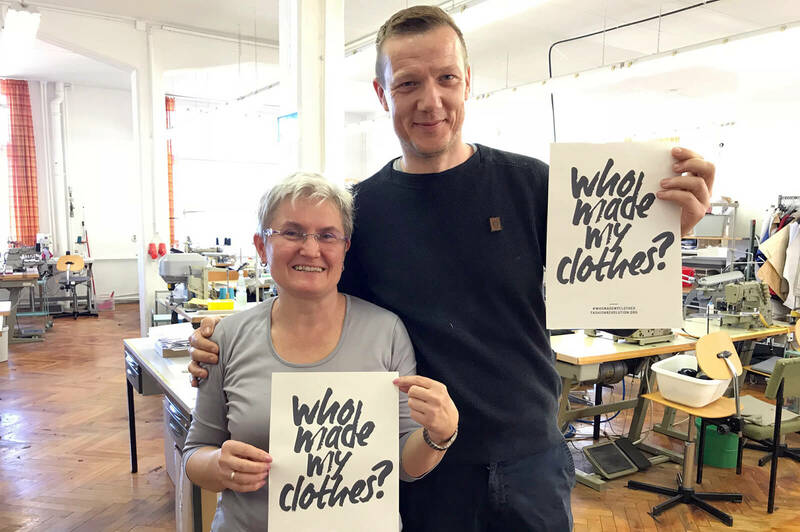 Who made my clothes – Why it is important to ask. Fashion Revolution Week is back and consumers shall ask fashion brands: „Who made my clothes?“ Who doesn’t know Fashion Revolution yet, it is a non-profit organization, which was founded after the collapse of the factory Rana Plaza in Bangladesh. This tragic accident killed 1,138 people and injured 2,500, making it one of the worst industrial disasters in history. What you should not forget is that this was not the only factory collapse in the textile industry. Since then, Fashion Revolution has been calling for Fashion Revolution Week on April 24th to commemorate the victims of Rana Plaza and to change the fashion industry. I was also shocked from this tragic accident and I began questioning my shopping behaviour and the industry in which I worked. Until then, I loved fashion. I tried out new trends and waited longingly for every ZARA-Sale. I was eagerly awaiting every H&M Designer collaboration. When I was in London for the first time, I definitely had to go to Primark. I knew the latest It-bags and -shoes and dreamed of making enough money to afford them someday. I had so much clothes and so many more shoes and still wore the same things every day. Rana Plaza shook me, but I could not or did not want to change my shopping behaviour. It wasn’t until I visited the Fast Fashion exhibition that I felt uneasy about how we consumers had degraded fashion to a disposable product and the impact it had on the environment and people. I will never forget how I left the exhibition and felt really sad. Sad about the negative facets of the industry in which I worked with passion. I could not identify myself with the values of my old employer anymore. I had great colleagues and worked under good working conditions. But I could no longer share the mentality of “selling more for lower prices”. I realized that it had to be sustainable fashion. This was the only way for me to continue to work in this industry. When we moved to Berlin I got the chance to change my job. It was not clear from the beginning that I would devote myself to sustainable fashion. But when I used my free time to reflect on the last years of my professional life, I realized that it had to be sustainable fashion. This was the only way for me to continue to work in this industry. This decision felt and still feels right. Finally, I had the feeling that I could actively change the fashion industry. I already told you about the difficulties of designing modern, sustainable fashion in previous blog posts. The minimum quantity problem and the small selection of beautiful sustainable fabrics caused me headaches. How should I make sustainable fashion when the industry urges me to buy the highest possible quantities of fabric and produce the highest possible quantities? As I generally tend to choose the most difficult way, I set myself the goal to implement a local production in Germany. „Why do you manufacture in Germany? Isn’t that expensive? You have many contacts abroad“. Yeah, it’s expensive. And yes, I have many contacts abroad, where it would only cost me a third or even less – and the sampling costs of about 300 € per style would be dropped. When I founded l’amour est bleu, I set myself the goal of establishing a 100% sustainable supply chain. This goal quickly became wishful thinking. According to fabrics, certifications enabled me to ensure that the supply chain from fibre to finished fabric was environmentally friendly and socially fair. But according production I had to give up: Fairtrade- or GOTS-certified production facilities laughed at me when I wanted to order 50 pieces per style. I could have chosen one of the suppliers from my old jobs. But I knew that a producer abroad was inevitably connected with many trips to control working conditions. I could not sell sustainable fashion with a clear conscience if I could not be 100% sure that my supplier really produced under fair conditions. Or does not pass the order to subcontractors. The factory was actually a home in which high clothing towers were gathered. Between them were one or two sewing machines. My family told me they made fashion for Western brands, but they couldn’t tell me which ones. At the end of my fashion design studies I experienced how common it was to outsource textile productions to subcontractors who finishes the order at very low price conditions. Due to the high price pressure that Western fashion brands put on suppliers, they are often forced to go this way. The problem is that you don’t know to whom the order will be passed. Under what conditions do the dressmakers work? Are children possibly involved? At the end of my studies I travelled with my family to Vietnam for the first time. We visited relatives in a small village called Mytho. 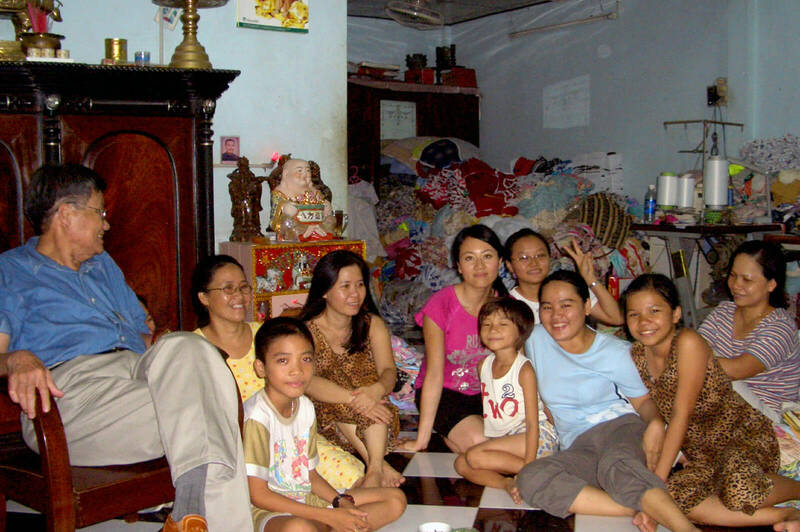 In Vietnam, many people leave their doors open – a welcoming gesture that gave me an insight into many houses. I discovered huge towers of clothing in them. My family worked in the clothing industry and I was allowed to take a look at their work. The factory was actually a home in which high clothing towers were gathered. 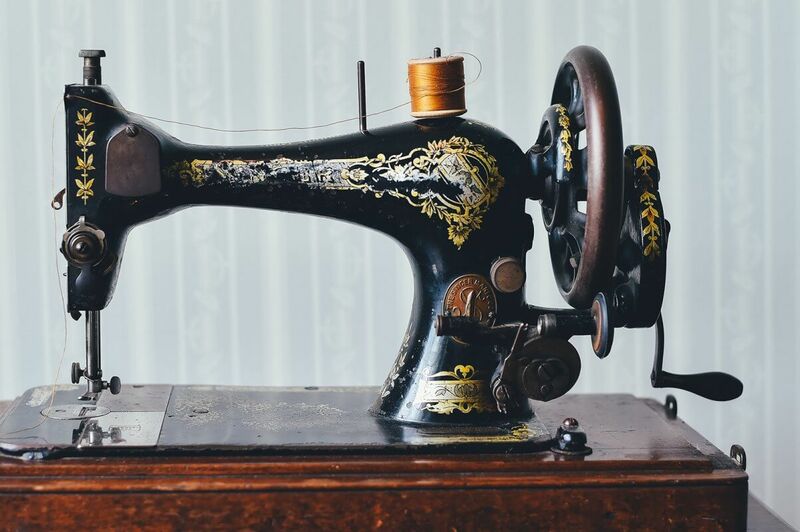 Between them were one or two sewing machines. My family told me they made fashion for Western brands, but they couldn’t tell me which ones. „Someone brings us the cut fabrics and we sew the clothes together.“ They showed me a cargo pants with pockets, pants you can find at H&M, Takko or other cheaper fashion brands. My relatives earned 70 cents for each pair of pants they sewed. My question, whether the other houses with the clothing towers were also doing such work, was affirmed by them. I didn’t understand this system back then. But I was shocked about this low production price, because I knew that such trousers cost about 19.90 € at H&M. When I later started working in the fashion industry, I understood what I had seen in Vietnam. None of my former employers deliberately handed over their orders to questionable subcontractors. It was the supplier who did it illegally. Sometimes the company was lucky and found out for itself, in the worst case it was the press. With my first employer, I experienced the circumstances that forced suppliers to apply such practices. My first job was as a designer, buyer and quality controller. Far too many tasks for one person, but I think that shows perfectly how the working conditions in this company were. As a buyer, I had to negotiate production prices with suppliers, which I received from another department. The pressure was high, as higher production prices were not accepted. Every day we put pressure on suppliers whose existence depended on the high order volumes of this fashion company. My boss was a woman in her late 20s (or early 30s) who more than realized herself in her profession. She and many other colleagues worked every day of the month and spent a weekend or max. two at home. Accordingly, these women no longer had a relationship with reality. My boss benefit from her powerful position and canceled finished orders without hesitation because the delivery date was postponed or a seam did not please her. Once she drove a producer into bankruptcy because she cancelled a high order. For her, this was a success that she had to share with the other colleagues during her lunch break. I only stayed in this place for six months. It was a terrible time, but I took a lot with me for my future professional life. These experiences shaped me so much that I decided to do everything differently. I wanted to know my suppliers well and to be able to trust them. I also didn’t want to spend most of my time on trips abroad but I wanted to invest this time in my family instead. Therefore a production in Germany was the best solution. The selection was quite small, I could find four suppliers and decided for the Studio U&N. The former managing director seemed friendly, professional and competent. Her successor Mr. Weißbach also made a good impression on me, which was confirmed. When I met them personally, I realized that we shared the same corporate values. I was also enchanted by the place itself. Jahnsdorf is a small village with many small houses that are so sweet that garden gnomes could live in them. I liked the idea of being able to offer jobs for women living in this village. The 27 dressmakers from Studio U&N are middle-aged, down-to-earth women who do not use social media and are photo-shy. I was more than pleased that the production manager Mrs. Kolleck agreed to take a photo with Mr. Weißbach. When I opened my mail, I had to discover that I had sent them the „Who made my clothes“ sign instead of the „I made your clothes“ sign. Anyway, they both laughed so kindly on this photo that I accepted it with gratitude. Dieser Eintrag wurde veröffentlicht am Allgemein und getaggt faire Produktion, Fashion Revolution, Made in Germany, Modeindustrie, nachhaltige Mode, Nachhaltigkeit, Rana Plaza, Unterlieferanten, Vietnam, Who made my clothes. Who made my clothes – Warum es wichtig ist, danach zu fragen.